To save a version of the current state of your prototype, go to the toolbar and click on the “Save as” button. A pop-up will ask you to enter a name for the new prototype version. Enter a name such as “Version 1” and confirm. Et voilà, you have created your first milestone! At any point in time, you can switch back to previously saved versions of your prototype (almost like in a time machine). To do so, go to My Prototypes and open the Versions tab of your prototype. The “Base version” dropdown shows a list of all available versions of your prototype including your milestones and autosaved versions. The version date and author are listed after each version. To access an old version, select it from the dropdown and click the “Create a copy of the selected version” button. This adds the selected version as a new entry to your prototype list in “My Prototypes”. It will carry the same name as the original with the word “Copy” added at the end. 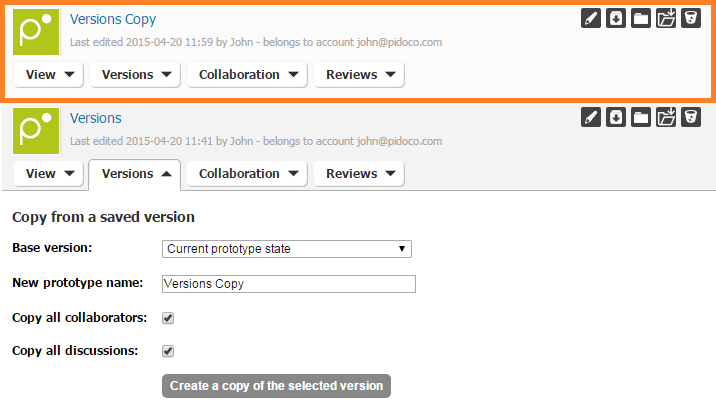 You can choose whether existing collaborators or discussion entries should be included in the copy. That’s it! You have successfully created your first milestone! Do you need help? Just send us a message via support@pidoco.com or Facebook, Twitter or Google+.